Swipe the coins in one of six possible directions. Coins with the same value will merge yielding the next value. Example: Two 1 EUR coins will convert to one 2 EUR coin. Your score will increase by 200 points (200 Euro-Cents). Your goal: Try to play for superior coins and notes. You can undo up to three moves by clicking the arrow in the upper right corner of the screen. If no further moves are possible you can launch a new game by clicking the Play button. There is good news: Compared to similar games you do not have to start from the very beginning if you launch a new game! 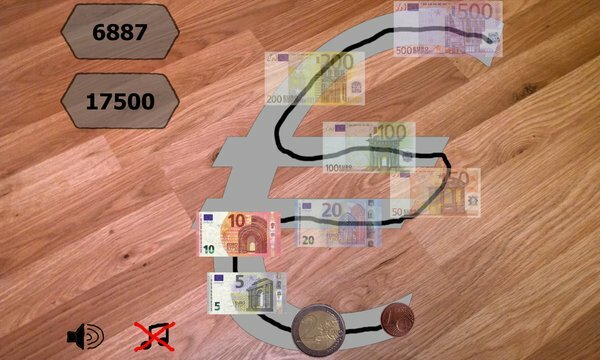 If for example you have already won the 10 EUR note you can reset to the game status of the 10 EUR note. You may also reset to the game status of the 5 EUR note or 2 EUR coin. There is a sound effect for the merging of coins and background music. Find the corresponding buttons in the lower left corner of the screen. You switched on sound and music but everything is silent? Check the volume of your cell phone or PC. You can always save the current game status by clicking "save to cloud". If you have installed exactly the same version of Euro-Coins on different hardware (tablet, phone) you can synchronize the game status. This however may take some time and it is crucial that you are logged in with the same Microsoft Account. You can make visible the last saved or synchronized game status via "load from cloud". Quite unsurprisingly you can launch a new game by pushing the button "New Game". 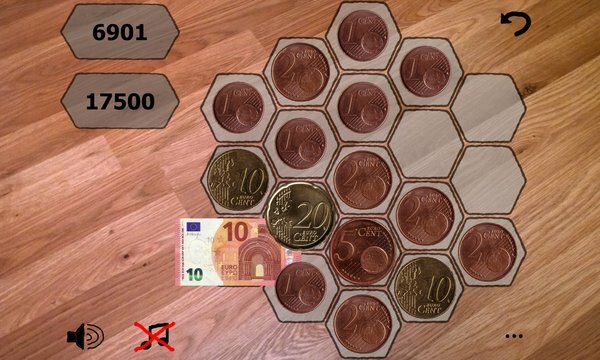 Finally some advice concerning your game strategy: Always try to keep neighboring coins or bills (20 EUR, 50 EUR) in close neighborhood of hexagonal cells. So that you can play this intelligent game free of charge we display some ads.